Syllabus of the Online Course (Subject): Boao Forum for Asia. Asian Economic Development. As a non-Government and non-profit international organisation, the Boao Forum for Asia (BFA) is a forum for Governments, business and academics in Asia to share visions on the most pressing topics in this dynamic region. 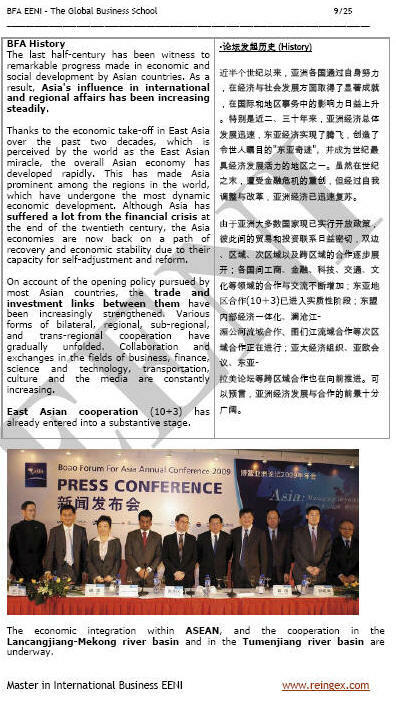 The Boao Forum for Asia is committed to promoting regional economic integration of international trade (imports, exports, services, foreign direct investment) and bringing Asian Countries even closer to their development goals. 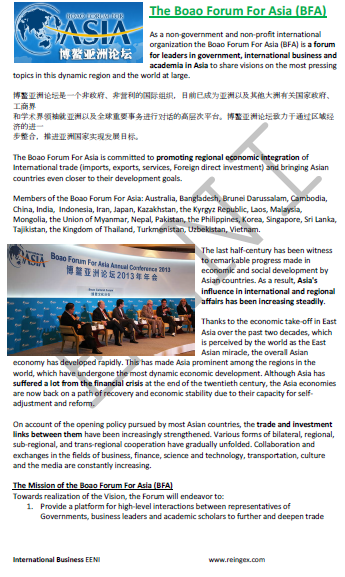 The members of the Boao Forum for Asia are Australia, Bangladesh, Brunei Darussalam, Cambodia, China, India, Indonesia, Iran, Japan, Kazakhstan, the Kyrgyz Republic, Laos, Malaysia, Mongolia, Myanmar, Nepal, Pakistan, the Philippines, Korea, Singapore, Sri Lanka, Tajikistan, the Kingdom of Thailand, Turkmenistan, Uzbekistan, and Vietnam. The last fifty years has been witness to remarkable progress made in the economic and social development of the Asian Countries. As a result, the influence of Asia on international and regional affairs has been increasing steadily. The economic integration within the Association of Southeast Asian Nations (ASEAN), and cooperation in the Mekong river basin and “Tumenjiang” River Basin are underway. The Boao Forum for Asia belongs to Sinic-Buddhist Civilisation, Hindu Civilisation and Islamic Civilisation.